As you take your fish oil supplement, feed your pet, or apply your lipstick there’s a chance your daily life is impacted by a 15-inch ocean dweller, Brevoortia tyrannus, a fierce-sounding name for a mild-mannered fish. That’s because all of these products are derived from the filter feeder better known as menhaden or bunker. This fish, which also makes irresistible bait for striped bass and other predators, is the number one species by volume harvested along the Atlantic coast. Labelled by some scientists as “the most important fish in the sea” because of the crucial role they play in the marine ecosystem, menhaden provide food for gamefish such as tuna, swordfish and stripers. In addition, they feed on phytoplankton. Adult menhaden filter seven gallons of water per minute and help keep the marine habitat cleaner. Although menhaden have been in the news many times during the past few years as the victims of massive fish kills, consumers and commercial fishermen alike should take comfort from the knowledge that they appear to be thriving. Joe Warren, an associate professor with the School of Marine and Atmospheric Sciences at Stony Brook University, agrees. Professor Warren’s lab uses acoustics to estimate the biomass (weight) of menhaden in the Peconic River and Flanders Bay. That’s essentially the same technology recreational fishermen employ using fishfinders. He and his graduate students have conducted multiple surveys in 2015 and 2016 in the shallow waters of these locations, which average between one and a half and two meters in depth, with a maximum depth of four and a half meters in the deepest part of the survey grid. The surveys were initiated in the aftermath of three individual fish kills in the area in May and June 2015. The Warren team conducted four surveys from June to November 2015 and 10 surveys from May to late October 2016, when the fish were migrating into or leaving estuarine waters. 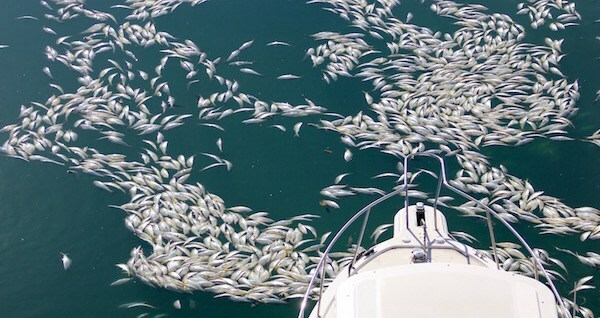 Dr. Warren said there are many factors that can lead to menhaden kills, from algal blooms to schools of fish swimming into dead-ends in such dense formations that they suffocate from lack of oxygen. Bunker died en masse at the Shinnecock Canal lock last November when they were trapped against the closed lock on an incoming tide. “There is a lot of variability in the number of menhaden in these waters from survey to survey, partly because the fish are mobile,” said Warren, estimating that the 2015 fish kill affected between four and six percent of the menhaden population. Warren further observed that each of the surveys encountered anywhere from five to 25 schools that could range from hundreds to tens of thousands of fish. The professor cited anecdotal evidence that there are more bunker in New York waters as humpback whales off the Atlantic coast on the south side of Long Island have been observed feeding on bunker during the past several years. “Five to ten years ago, you would never have seen that,” he said. Dr. Warren added that he hopes to expand the surveys to offshore ocean surveys, while continuing to monitor the Peconic waters. John J. Hall, representing Save the Great South Bay, wrote to Atlantic States Marine Fisheries Commission in January 2017 to make his case for the continued reduced harvest limits for menhaden, citing boosts for Long Island fisheries, tourism (whale-watching etc.) and the environment. The menhaden industry is controlled by a single company, Omega Protein, which harvests 80 percent of the fish stock for use in oil supplements, fertilizers and animal feed. “Fewer menhaden being harvested by the Omega Protein Corporation, for example, leaves more menhaden for the rest of the fishing community,” wrote Mr. Hall. The letter urges a return to the widespread use of menhaden as crop fertilizer, a practice that was begun in 1790 on Long Island, according to the 1972 book “Greenport Yesterday and Today, the Diary of a Country Newspaper” by Elsie Knapp Corwin and Frederick Langton Corwin. “This practice has not been common,” says Mr. Hall, “due to the available population of menhaden as well as the availability of cheap, quick-release petroleum-based fertilizers,” the very chemicals that scientists say have contributed to run-off that results in algal blooms. In a 2015 National Geographic blog, marine biologist and author Carl Safina cautioned against doing a victory lap just yet over improved menhaden populations, because the Fisheries Commission voted to increase the catch limit by ten percent for the 2015 and 2016 seasons, which primarily benefits Omega Protein, since it harvests the lion’s share of menhaden. He also referred to Hall’s letter urging for the Atlantic State Marine Fisheries Commission to freeze the catch limit until it is determined how many bunker must be left in the oceans to provide food for larger fish, seabirds and whales. One thing is certain: the story of the Long Island menhaden fishery is more about nostalgia than economic promise. At the last of the menhaden plants, now repurposed, in Napeague. In 1883, there were 90 fish factories along the shores of Promised Land in Napeague, where fish were steamed in enormous tanks, holding about 500,0000 fish each, and then pressed for their oil and the carcasses dried for fertilizer, according to the Corwins’ book. It was a stinky operation. According to the United States Fisheries Bulletin for the year 1898, menhaden fisheries on Long Island employed 9,348 on 601 vessels. Omega Protein, headquartered in Texas and with an Atlantic facility based in Virginia, employs 1,100 worldwide at seven manufacturing plants and exports its products to more than 40 countries. Some scientists still see more of a silver lining in the story about this silver fish. They are not doing very well in the Chesapeake, the bay is all but dead. Predator fish have nothing to eat. Omega and our politicians have a policy, Omega gets it all screw everyone else.